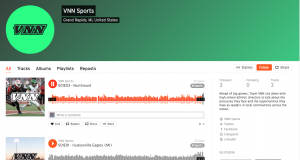 Northmont, Assistant AD, Jim Smith was interviewed by VNN Sports on their Podcast Series. Northmont is the third school interviewed in the series, the first school in Ohio. In the Podcast, Jim talks about the Northmont Community, the School District, using Technology in the Athletic Department, and many more items happening at Northmont. Take some time to listen to the broadcast via iTunes and Soundcloud. Directions are below. Wanted to write all of you with some big news. Our podcast, where we sit down and have conversations with ADs around the nation about their programs and communities, is live on iTunes and Soundcloud! You can subscribe on Apple iTunes here, Google Play here, and if you just want to listen on your computer, we have our episodes on Soundcloud.